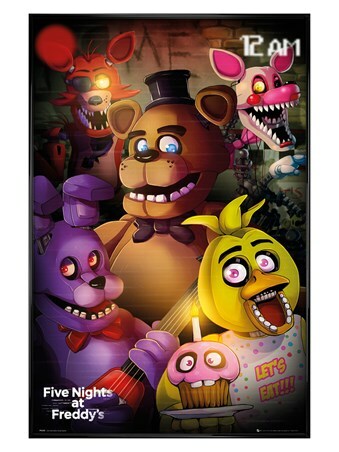 If a little horror here and there never scared you, then you'll be ready to fully immerse yourself in the world of Five Nights At Freddy's: a survival mystery horror video game, in which players must act as a night security guard at pizza restaurant, 'Freddy Fazbear's Pizza'. 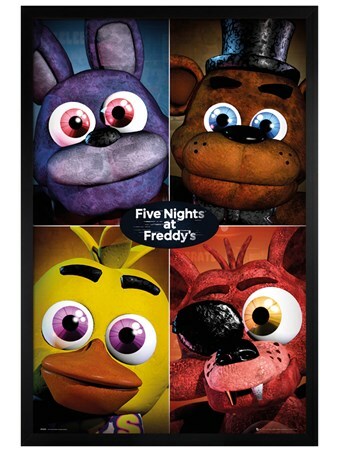 This terrifying poster pictures the malfunctioning animatronic characters featured throughout the game, including Bonnie the Bunny and Chica the Chicken, seen wearing a creepy 'Let's Eat!' vest. So if you think you've got what it takes to survive the night, we dare you to take a step into Fazbear's...Complete with a 61cm x 91.5cm gloss black plastic frame, fronted with transparent Perspex and ready to hang in your home. High quality, framed Gloss Black Framed Freddy's Fright Night, Five Nights At Freddy's framed poster with a bespoke frame by our custom framing service.